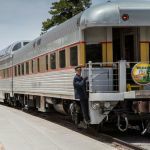 Step back in history and ride a vintage train between Williams, AZ and the Grand Canyon South Rim! 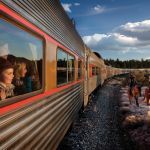 The Railway Express tour is a morning departure from the Grand Canyon Historic Village. 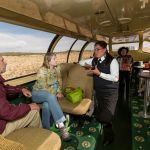 The tour begins with a sixty minute van ride to the Williams Train Depot where you will start your day by watching an Arizona gunfight. 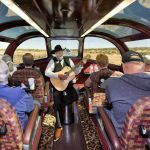 You will then board the train for a trip back to the canyon, complete with strolling musicians and cowboys to entertain you. It is an authentic Wild West adventure. 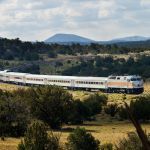 The train travels across the wide open Northern Arizona landscape, and you will be overwhelmed by the natural beauty and changing ecosystems. Keep in mind the trip does not offer canyon views. 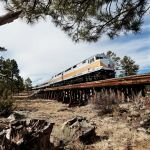 1950s era diesel locomotives power the train year-round. The cost for the tour is $65.00 per adult (age 17 and up) and $37.00 per child age 16 and under.